The fourth entry in the series of open-world action games, in which the players assume the role of chaos-wrecking Rico Rodriguez. This time, he is trying to bring order to the fictional country of Solis in South America. The main protagonist of Just Cause 4 is Rico Rodriguez, a character well known from previous entries in the series. This time, he enters the fictional country of Solis in South America. The citizens of this country must face harsh weather conditions and the regime of the Black Hand – a paramilitary organization led by the merciless Gabriela Morales. Rico must deal with her by wrecking chaos and destruction wherever he appears. He will also discover the truth about his father. 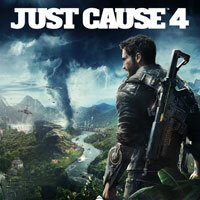 In Just Cause 4, the action is presented from a third-person perspective. The players are taken to an open world the size of one thousand twenty-four square kilometers. It’s the biggest sandbox map Avalanche Studios ever created and it includes tropical forests, high mountains, deserts, cities, and villages. The players can travel through the areas on foot and by using various vehicles. In addition to motorcycles, cars, helicopters, and jets, there are transporters, bulldozers, cranes, jet skis, and microjets available. The players can also glide with a wingsuit or participate in parachute jumping. During the game, the players are completing story missions and various side activities that gradually reduce the influence of the Black Hand. Rico can use a variety of weapons and gadgets, including the famous grappling hook that enables him to join various items and objects together. Although it was possible to use the tool in various ways in the previous game in the series, now it is even more versatile – the players can customize it and, for example, add a rocket launcher to it that makes the objects connected to it float in the air. The greatest novelty in Just Cause 4 are dynamically changing, extreme weather conditions like tornadoes, sandstorms, blizzards etc. They can provide Rico with an advantage; these aren’t merely visual effects, but fully simulated events. For example, a tornado can consume cars and smaller objects and destroy buildings. Just Cause 4 guide is a collection of the best tips and a detailed walkthrough for this very effective action game.